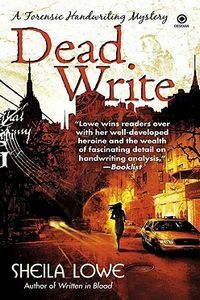 Dead Write by Sheila Lowe, a Mysterious Review. Review: Renowned graphologist Claudia Rose is hired by the owner of an exclusive dating service to help profile prospective clients and provide better matches in Dead Write, the third mystery in this cozy series with an edge by Sheila Lowe. Or at least that's what Claudia thinks. Actually, she really doesn't know why Baroness Grusha Olinetsky hires her. Claudia leaves Los Angeles for New York City on the spur of the moment only to find she's the third handwriting expert hired by Grusha, and then she discovers that two of the samples that she's given to analyze are of dead people. "[Claudia] considered the demographics: four women, six men, aged from their mid-twenties to late thirties. Their careers were varied. From the information in their files, there was no connection that she could see. Except that two of them are dead. It kept coming back to that. Why would the baroness want me to analyze the handwritings of two dead clients?" Why indeed. She shouldn't need to wonder; she should just submit her analysis report, and return to Los Angeles. And that's the real problem with Dead Write: Claudia's motivation for staying and participating in what ends up being a fairly complicated police investigation. She doesn't seem to need the money, the handwriting samples aren't intellectually challenging, the assignment isn't furthering her career professionally, and she misses her daughter and her boyfriend. Any sensible person would submit an invoice for services rendered and move on. This isn't to say that the plot isn't well thought out, or isn't suspenseful in and of itself with an interesting twist and turn here and there. It's just that it's hard to engage the reader when the protagonist has no rational, or even probable, reason for being involved. Acknowledgment: Penguin Group provided a copy of Dead Write for this review.